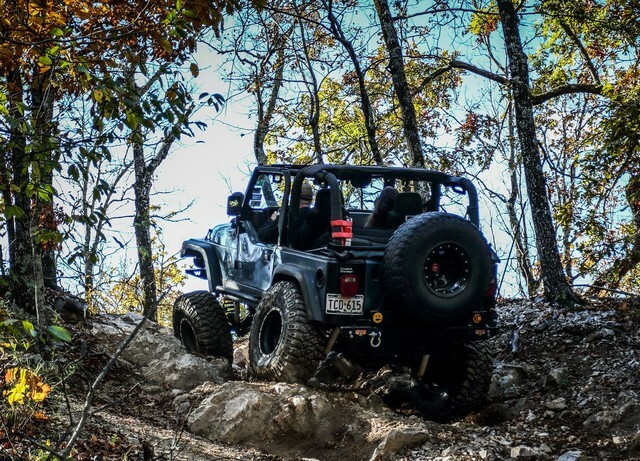 Congratulations to Josh “Jeepfeste” for December 2014 JOTM Winner! This pic was taken at Hot Springs, AR during the Fall Veteran’s Day trip with the club. I have to give credit to Bob (offcamber) Lionel for taking this great picture of my 1999 Wrangler TJ as I crawled up near the top of Sesame Street. Would also like to thank JeepinJason and his wife for guiding us through the many miles of trails on Saturday. At the top of that hill, my wife Rashea, mentioned to me that I was making those trails/climbs look easy. After looking at the pics like this one, I have a new appreciation for the amount of flex my 6″ Full-traction long-arm suspension provides to keep my 35″ M/T tires and 5 spd manual power on the ground to hold a line I choose. Hopefully my latest upgrade will let me climb up Bailey’s Boulders with ease next time out. Happy Trails everyone! ← November 2014 JOTM Winner!